The four gospels in the New Testament were hand selected from hundreds of written texts by various cardinals and high priests of the Roman Catholic Church about 170 years after Jesus allegedly walked the earth. The final canon was officially agreed upon around 350 AD. Now that the Gospel of Barnabas has surfaced in Turkey, Vatican scholars are working hard to discredit it as an authentic work. And if we take time to study the contents of this latest document, it is easy to understand why the church wants it swept away and forgotten. It attacks the foundations of Christianity and suggests that Muhammad was the real Son of God. Over the years many writings that were discarded by the church as were books discarded by the Jews when collecting Old Testament writings. All books failing to fit the established religious doctrine of the day, and were contradictory to the books chosen for inclusion, or viewed as heretical, were carefully removed. It should be interesting to note that the Catholic Bible contains books that are omitted from the King James Bible. This is because the Bible scholars collecting works for the king’s protestant Bible did not agree with material published in the Catholic Bible. Some of the omitted books that are now known to exist included: The Book of Enoch, the Gospel of Phillip, the Gospel of Thomas, the Book of Mary and the Book of Judas. Some of these works may have been written by people who really knew Jesus and give a more accurate record of what happened at the time Jesus lived. And now appears the Gospel of Barnabas. So who was Barnabas? He was an early Christian who traveled with Paul. He is mentioned in the Book of Acts and is mentioned in some of Paul’s epistles. 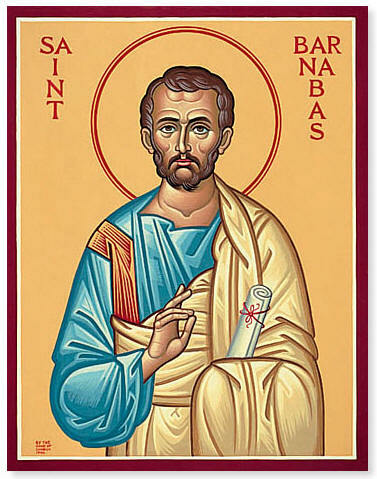 Barnabas helped start the Christian church but like Paul, probably never knew Jesus in person. Yet it is very possible that Barnabas also wrote a gospel of record. The Barnabas story, found hidden in the Ethnography Museum of Ankara, Turkey, accuses Paul as “The Imposter,” claims that Judas was the one who was crucified and that Jesus was a prophet, but never claimed to be the son of God. The text, written in Aramaic, offers a vision supportive of the Islamic belief, and contradicts New Testament stories. Barnabas writes that Jesus predicted the coming of the Prophet Muhammad, the founder of the Islamic faith some 700 years later. Aramaic was the language spoken when Jesus lived. Naturally the Gospel of Barnabas has stirred much excitement among the Islamic nations. But Marco Tosatti, a Bible scholar from Rome has disputed the writings, calling the discovery a possible hoax, which was to be expected. Tosatti wrote that grammatical and conceptual errors “are obvious and quite significant.” He notes that a reference to the text as a “book” was out of form among the monks who allegedly copied the script. He finds a problem in that the book’s inscription dates the writing at 1500 AD, and that the text speaks of three armies of Palestine made up of 200,000 soldiers. Tosatti writes that according to historical record, the entire population of Palestine may not have exceeded 200,000 people at that time. The latter statement does not seem to make much sense. Perhaps Jesus was identifying Muhammad as yet another prophet destined to follow him. And this became an historical fact. Both prophets had important messages for the world, but both became the cause of two great religious movements that missed the points made by their teachers.